Pastel on pastel card. Prints from a limited edition of 250. 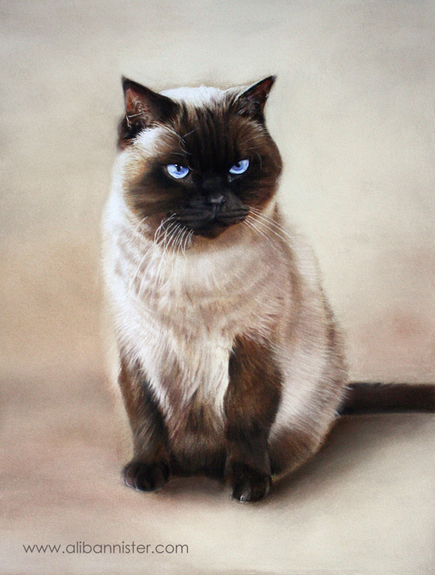 Bumble Winchester, known as 'Bug' to his friends, was a very splendid seal-point British Shorthaired cat. He was an extremely laid back chap who moved easily around the UK with his owner Rachael, living everywhere from Aberdeen to Exeter. As long as he got fed he was content. In fact, he once arrived through the catflap on a Sunday lunchtime with a large and perfect slice of beef, complete with gravy, clamped firmly between his teeth. Rachael never found out who's lunch he had stolen!